It was not until the middle of this century that a member of the 337-year-old Harvard Corporation was drawn from the great geographical void that lays beyond Boston and New York. The member, William L. Marbury, a resident of Baltimore, "was one the great heroes" of the Corporation, recalls former President Nathan M. Pusey '28. In order to attend the twice-monthly Corporation meetings, Marbury "would ride the sleeper from Baltimore every Sunday night and ride back Monday night." Marbury's shuttling was made easier by the advent of the modern jet airliner. But his travel difficulties are the source of a dilemma which has dogged the Corporation on the rare occasions that it has to choose a new member--how to draw members who are geographically representative of the entire Harvard community. In past years the problems in filling a seat on the Corporation have broadened into larger issues that transcend geography. The question for the Corporation when it selects its newest member next year is how can it represent a sweeping constituency of students, faculty, and alumni on a board of only seven people. Occupation, professional interest, and more recently gender and race have emerged as factors increasingly important to the selection process. The University's chief governing body, the oldest Corporation in the Western Hemisphere, has never had a member who was not white and male. The pressure to pick a minority or female member has increased as the Corporation readies its search for a successor to retiring member Andrew Heiskell, the former chairman of Time Magazine. As an informal search gets underway, officials say they are working from a 300-name list compiled the last time a spot opened up two years ago. The search process this year has already begun with internal solicitations of names from certain key officials. The formal process of finding a replacement for Heiskell, held up pending the return of President Bok from his three-month sabbatical, will begin with the formation of a search committee that includes Bok, several corporation members and several members of the Board of Overseers. Some members of the administration, including several Corporation members, have said they would favor a woman or minority on the Corporation if a suitable candidate could be found. President Bok himself has publicly stated that high priority is being given to such candidates. "Everyone would agree that it would be a good thing to get a woman or a minority," says Corporation member Henry Rosovsky. The names of several women and minority candidates have already surfaced. They include: former U.S. Transportation Secretary William T. Coleman Jr., now a practicing lawyer he has placed highly in past searches; Joan T. Bok '51, no relation to Derek Bok, she is the President of New England Electric and former president of the Board of Overseers; former Secretary of the Army Clifford Alexander '55, now a Washington attorney; and Donald M. Stewart, president of the College Board which administers the Scholastic Aptitude Test and former president of Spellman College. Yet even proponents of such candidates caution there could be problems in choosing a Corporation member solely based on race and gender because of the tiny size of the Board. More important factors such as the Corporation's need for a scientific specialist may override pressure for a choice based on gender or race. "It's very hard to make a Noah's ark out of five people," says former Corporation member Francis H. Burr '35. Longtime Corporation-watchers place a higher value on professional representation as a criterion for selection to the Board, which until Hugh T. Calkins '45 stepped down two years ago included two lawyers, two businessmen and one academic. The board replaced Calkins with Rosovsky and now has no lawyers aside from Bok. Some close to the process have speculated that Bok, a labor lawyer by training, may look for a board member with extensive legal expertise. "Derek feels that he misses a lawyer," says Rosovsky. According to former University Treasurer and Corporation member George Putnam '49, an increasingly complicated array of medical schools and hospitals under Harvard's wing may prompt the seven-man board to look at a medical expert for the board. Other considerations that come into play in choosing a Corporation member may be more specific. A decade ago, when Harvard was contemplating its largest-ever fund drive for the 350th celebration, it selected Heiskell, a prominent member of the New York business community. His ties to philanthropic institutions, such as the prestigious New York Library Committee, made him a logical choice for an opening in 1979. 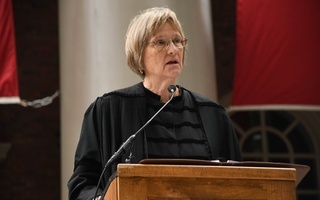 The choice of Heiskell marked the final abandonment of a traditional requirement that each Corporation member hold a Harvard degree. Heiskell attended the Harvard Business School but received no degree.